This evening, I will show you guys how to share your blog posts to Facebook Pages and Twitter automatically after publishing them on your blog. There are actually many ways you can do this but in this post, I will recommend you to use TwitterFeed as it will allow you to share a blog post automatically to many Facebook pages and twitter you have rights to publish to. ==> Click on "Create New Feed"
==> Enter your blog name as the "Feed Name"
==> Click on "Continue to Step 2"
==> Click the "Facebook OR Twitter" Service and click on 'Connect with Facebook"
Allow TwitterFeed to connect to your Facebook or Twitter which ever you may choose. ==> From the drop down, select the page you want to automatically share your blog posts to. ==> Leave the UTM tags as they are. You can add a "campaign" name though. I use that to track the traffic in Google Anaytics. 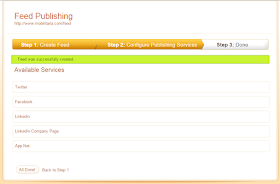 ==> Click "Create Service" button. Right on this page, you can add more services. Also take note of the expiry date. Once it expires, it will stop posting. So, you will have to re-add the page. 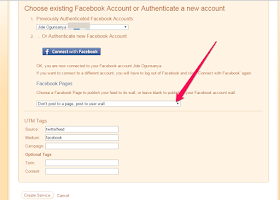 You can click "Facebook OR Twitter" service again, follow steps above to link more Facebook pages and your Twitter. When you're done, click "All Done" button. It was great reading this and I think you are completely correct. Inform me in case you're considering mesothelioma case lawyer, that's my major expertise. I'm hoping to hear from you soon, bye for now! I was conversing with a good friend of my own about this and regarding hd movies online too. I think you made some great points in this case, we're also looking forward to keep reading material from you. Admiring the time and effort you invested in your blog and comprehensive details you offer. It really is good to discover a blogging site from time to time which is not the similar out of date re-written stuff. Great read! I have bookmarked your website and I'm including your RSS feeds to my own dentist search site. You're totally right! I really liked reading through this and I will come back for more as soon as possible. My website is dealing with free films, you could take a look if you're still interested in this.